Step 1. Host a party for 30 the night before. Step 2. Take leftovers to neighbor's house and fill out with salad, bread, side, and a dessert. Sounds easy, right? Tagert had his annual holiday party and, as is usually the case, invited 30 and cooked for 45. Tagert usually serves a turkey breast and a pork loin that guests can carve themselves for sandwiches and he always cooks extra. 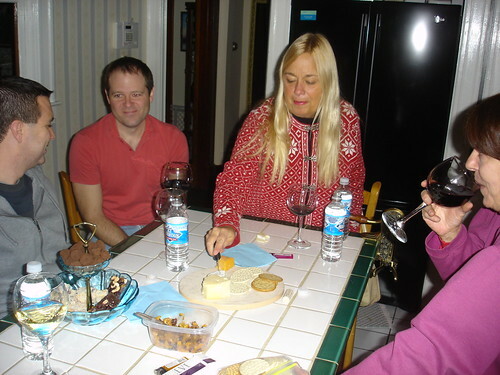 He also had leftover cheese and crackers (who doesn't have leftover cheese and crackers from a party? They hang around for weeks! ), a tapenade, a killer spinach artichoke dip, and a few other nibbly odds and ends. So he loaded all that up and took it over to Sharon's. Sharon prepared a caesar salad and bread, I brought a sweet potato gratin I'd been wanting to try out, and Karin brought a great pineapple angel food cake. We served 9 with minimal fuss, thanks of course to all the fuss Tagert put into preparing most of the food for his party. The most difficult part of this dish is peeling the pounds and pounds of potatoes, then running them through a slicer or mandoline. Once you get past that it's actually a really easy recipe to make and the results are incredible. I'm not going to copy the recipe because I really just added a few things, so follow it as linked above. I did make just a few modifications: 4 cloves of garlic instead of the 1 in the recipe, as was suggested by users; I didn't have thyme, so I used a bit of rosemary instead; and I added about 2 cups shaved gruyere into the warm cream that you pour on the gratin before its final round in the oven. It turned out really well - Karin's son AJ had seconds, and he doesn't even like sweet potatoes. Speaking of Karin...she is known for her baking skills, and she brought another great dish to top off the meal. Her Pineapple Angel Food Cake was really simple yet amazing. Add ingredients and stir to blend. Pour into prepared angel food cake pan and bake as instructed on mix. Serve with a dollop of whip cream (fresh is best, drop in some vanilla bean to really take it over the edge).